Henry David Thoreau’s account of his adventure in self-reliance on the shores of a pond in Massachusetts—part social experiment, part spiritual quest—is an enduringly influential American classic. In 1845, Thoreau began building a cabin at Walden Pond near Concord, Massachusetts. The inspiring and lyrical book that resulted is both a record of the two years Thoreau spent in withdrawal from society and a declaration of personal independence. By virtue of its casual, offhandedly brilliant wisdom and the easy splendor of its nature writing, Thoreau’s account of his immersion in solitude has become a signpost for the modern mind in an increasingly bewildering world. 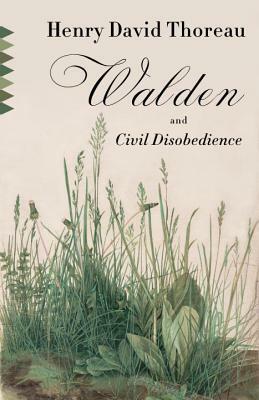 Also included in this edition is Thoreau’s famous essay, “Civil Disobedience,” inspired by his anti-war and anti-slavery sentiments, which has influenced nonviolent resistance movements around the world ever since. HENRY DAVID THOREAU (1817–1862) was an American poet, naturalist, abolitionist, and transcendentalist philosopher, born in Concord, Massachusetts. He is best known for Walden, his extensive nature writing, and his advocacy of civil disobedience to unjust laws.